Isagenix Joint & Pain Relief System - Buy at Wholesale Prices! This pack is designed for both immediate and long-lasting pain relief. The Isagenix Pain Relief Cream can be used for immediate pain relief, and the Joint Support soothes joint flare-ups and protects and rejuvenates overworked cartilage. The Isagenix Pain Relief Cream combines natural menthol and methyl salicylate to provide cooling and immediate relief, followed by the deeper heat that helps relax sore, tense muscles. 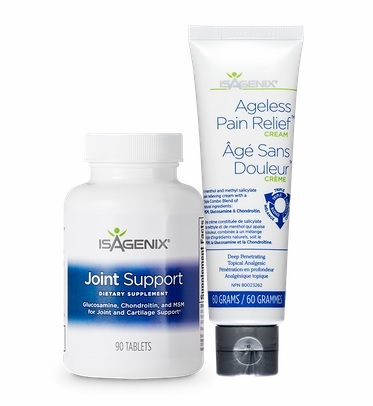 Isagenix Joint Support provides advanced triple action support through natural nutrients as well as comforting botanicals to help soothe joint flare-ups while it works to strengthen cartilage. All first-time orders have a 30-day product money back guarantee. View shipping rates and times. How Do I Buy Isagenix Joint and Pain Relief System in Canada? RECOMMENDED: Sign up and Save (CA$49.95) — Sign up to the Isagenix auto-ship program to become eligible to have access to the cheapest wholesale prices. At the end of the checkout process, you’ll be asked to set up your next month’s order. Autoship can be canceled at any time, even after you take advantage of the cheaper prices on your first order! There are no locked in contracts of any sort. Plus, this gives you the opportunity to participate in the Isagenix business (this is 100% optional). Full Retail (CA$66.60) — If you prefer not to sign up and take advantage of the lower pricing, you can purchase the products at a full retail price. This is not recommended as you can cancel auto-ship at any time. Your first order with IsaAxcess is covered by a product money back guarantee within 30 days. If you’re not completely satisfied with your Canadian Isagenix products, send them back to Isagenix Canada for a refund! Clicking on the Buy Now button below will take you to our Isagenix Associate website. From there, you can select ‘Sign Up and Save’ to purchase on auto-ship, or ‘Buy Now’ to purchase at full retail. All orders are covered by the highest levels of online security and shipped securely by Isagenix from the Canadian distribution center.